Reset power supply and fuel cut-off switch Fiat Ducato 3. From year: 2007, 2008, 2009, 2010, 2011, 2012, 2013, 2014. How to reset power supply and fuel cut-off switch Fiat Ducato III. 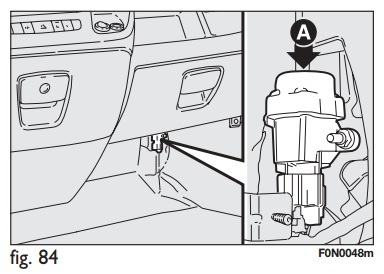 The vehicle is fitted with a safety switch that in the event of a crash comes into operation by cutting off fuel and turning off the engine as a consequence. When the inertial switch cuts in, fuel supply is stopped and hazard and sidelights will turn on, for turning off press button A. An additional safety switch is also fitted, that in the event of a crash comes into operation by cutting off the power supply. These two safety switches therefore prevent dangerous fuel leaks due to fuel line cracking and sparks or electric discharges due to amaging or malfunctioning of the electric components of the vehicle in the event of a crash. IMPORTANT After a crash, remember to remove the key from the ignition device to prevent battery run-down. If, after a crash no fuel leaks or damages to the electric devices (e.g. 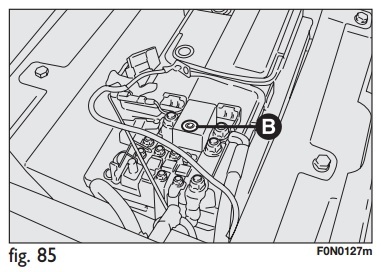 headlights) are found and the vehicle can be started again, reset the fuel cut-off switch and the power supply cut-off switch (where provided). Follow the instructions given below. If, after a crash, you smell fuel or see leaks from the fuel system, do not reset the switches to avoid fire risk. To reset the fuel cut-off switch, press button A. The switch is located on the battery positive terminal. press button B to reset the power supply switch. That it is the full procedure how to reset the memorised speed Fiat Ducato 3. If you like to reset any maintenance oil light after an oil change. Or reset check engine light, airbag light, inspection key or insp errors when maint reqd, for Toyota cars. Or any warning light for service reminder which appears on the display. Write in the search box the car name for which you want to find information, and find how to reset other service reminders by yourself.